E and I had our first DVD player when we lived in Pine Street, just after I graduated college. I suppose it was in a laptop of hers, because we didn’t have a television and I remember watching movies in bed. I was excited to reclaim some of the films of my youth long since lost on the beta tapes they were captured on, so between that year and the next I filled them all in. Dark Crystal, The Lost Boys, Labyrinth, and more. The thing about these nostalgia viewings is that you can re-watch the thing you once loved, but it might not produce the same magic. I was so excited to show E The Lost Boys, labelling it as a sort of proto-Buffy as we settled into bed to watch it, but it was laugh-out-loud lame. Yet, there are still new layers to unravel in Labyrinth. The 80s produced so much of those wonderful coming of age stories, and I don’t think I’m saying that because I was young at the time. Actually, I was ignorant of most of the stuff like Stand By Me and The Goonies, because at the ripe old age of seven I already felt I was too old for their messages. The Lost Boys, at least, had vampires. Yet, looking back there are so many seminal movies in that Amblin Entertainment model set by E.T. and Goonies that are still referenced today, right down to their feel being aped by films like Super 8. I’ve never seen Stand By Me or The Goonies. I know, I know – it’s sacrilege. Just now I looked them up on Wikipedia to make sure I wasn’t mistaking them for something else. It’s odd for me to watch this new generation of media being produced by the folks who came of age with the first set – usually a few years older than me, probably old enough to have seen these films in theatres on their own. The 80s vibe is unmistakeable, but I don’t know all their influences by heart the way I do things that reference David Bowie or Buffy The Vampire Slayer. Collects issues #1-5 written by Brian K. Vaughan with line art by Cliff Chiang, color art by Matt Wilson, and letters by Jared K. Fletcher. 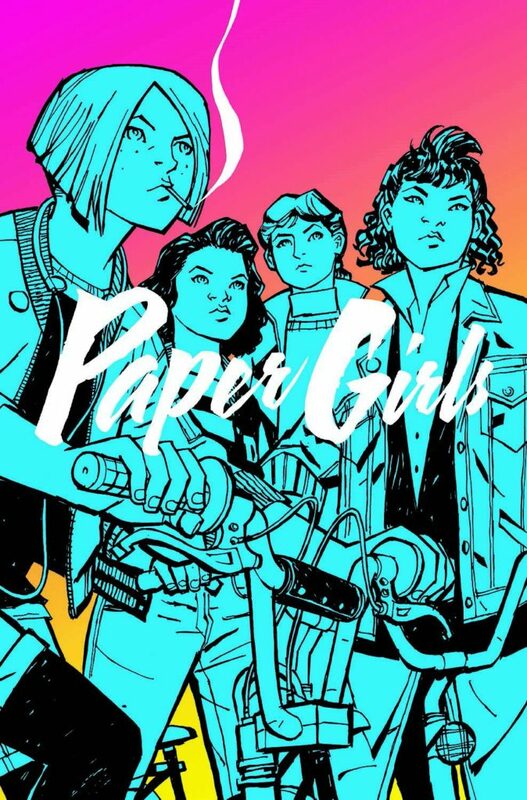 Paper Girls is the newest Brian K. Vaughan jam to hit its first collection, but I think you’d be better off waiting for a second trade paperback before you start reading. 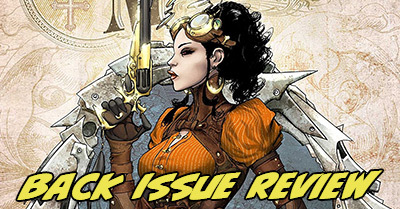 Vaughan is the master creator of critical hits like Y: The Last Man, Ex Machina, Marvel’s Runaways, The Private Eye, and the still-running deeply personal space fantasy Saga, which is currently the biggest independent comic after The Walking Dead. 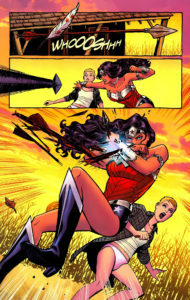 Vaughan is joined on this creator-owned Image Comics series by artist Cliff Chiang, directly from his run on DC’s Wonder Woman, and uber-colorist Matt Wilson, from everything. I’m not sure how it got that way. I had her Super Friends toy. I had seen the Lynda Carter show in syndication. The thing I remember most is a library book. I still have it, actually, on my now bookcase of comics. It was a collection of her earliest strips from the 40s. We had checked it out of the library so many times that I was under the impression it was my personal copy. I suppose my mother finally told them I had misplaced it somewhere and paid the fine so I could keep it. My love of Wonder Woman never expired, but I’ve never loved her comics the same way, aside from a thrilling mid-90s reimagining by William Messner-Loebs and Mike Deodato, Jr. I know I’ve missed a lot of Wonder Woman comics in the interim, and if DC could get their heads out of their asses on reprints maybe I could catch up on them. The relaunch is the perfect chance to launch Wonder Woman to the heights she belongs – equal to Superman and Batman, the holy trinity of the DC Universe. 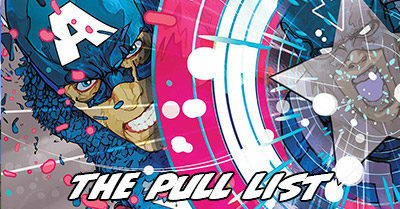 Is her new number one issue up to the task? #140 Review: Wonder Woman #1 hints at major myth-heavy plot to come, but has sparse script, hardly any WW in it, & angular, inconsistent art. Just okay. 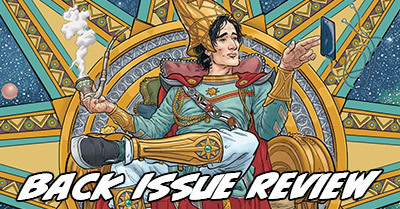 Wonder Woman #1 is an interesting comic book, but it’s simply not worthy of the redebut of one of DC’s holy trinity of heroes when we’ve seen absolutely stellar books from her compatriots Superman and Batman over the past two weeks. Brian Azzarello’s story is slight on script but full of action, both dramatic and in battle. It features a girl marked for death by a Pantheon of forces, a certain horror of growing centaurs out of horses’ necks, Hermes carrying around a Portkey to Wonder Woman, and a rogue son of a god who makes his own oracles from scratch. The elements hint at the possibilty of spectacular plots to come, but this issue is merely moving pieces into play on a chess board. I had major doubts about Chiang on Wonder Woman. He acquits himself adequately, but I don’t know that he merits all the many unscripted panels he gets here. His figures have a certain plainness to them that’s half DC animated half hieroglyphic, with thin limbs and angular features. A lot of his edges have a rough, unfinished look, which looks great on environments but can be a little off-putting on characters. What Chiang does get right is Wonder Woman – to a tee. He lets her look Amazonian while still staying svelte, and manages to convey coyness even when she’s standing bare naked in the middle of a room. The handful of panels of Diana in action will get your heart racing – Chiang is much better on action than conversation. It’s a pity she’s not in her own debut a little more, as whenever she is she’s magnetic. As for the cover, I cannot bring myself to like it. Diana’s figure is too far left looking off the page – it feels like half of an image. 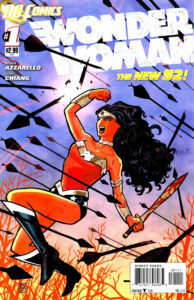 Azzarello might be the writer to pluck Wonder Woman from the rut she has been in for the past year, but it is going to take him a few issues to get there. Buy this first one only if you have the patience to hang in for the next few months.